I decided to keep posting a family favorite recipe from the blog (with any adaptions that we use regularly, if applicable) on the fourth Friday or Saturday of every month this year. This recipe will be one that we make quite often and that we all enjoy greatly. This post is the third Family Favorites recipe of 2019. This month's Family Favorite recipe is Gluten-Free Frosted Sugar Cookies. This is my regular Frosted Sugar Cookie recipe made gluten-free...with a few other tips and tricks shared, as well. These cookies are probably one of my most favorite, and definitely my family's favorite sugar cookie. They really are very easy to make, and are wheat, nut and fish-free (if all your ingredients are), and can be soy, milk and egg-free (see variations). They are also extremely soft (like a certain famous brand I will not mention by name that is sold is stores), and the frosting is creamy and indulgent. What's not to love, right? If frosted sugar cookies are your thing, you'll definitely want to try this recipe out! Note: The gluten-free flour I recommend does not technically contain soy, but it does contain xantham gum (see "Soy-Free" under variations for more details) which can cause issues for people with soy sensitivities or allergies. For this reason, I will not claim that this recipe is soy-free. I will share a soy-free alternative in variations, though. In large mixing bowl, mix together sugar, lard, eggs, sour cream and vanilla until well blended. Take about a Tablespoon of dough and roll it into a ball, and place the dough ball onto the ungreased cookie sheet and flatten it with your hand or the bottom of a glass, repeating the process for each cookie, spacing them about 1 inch apart. Transfer cookies onto waxed paper or brown paper or cooling rake to cool completely. Repeat steps 4 through 6 until all the dough is used up. While the cookies are cooling, mix together all the ingredients for the frosting portion except the milk in a medium mixing bowl until well blended. Recipe makes at least 3 dozen cookies (I normally get between 40 and 50, depending on size). Milk-Free: Use any milk substitute of your choice for the milk. Use any dairy-free "butter" for the butter in the recipe. You can even use shortening, lard or coconut oil if they fit your dietary needs. Sub a dairy-free yogurt (plain or vanilla) for the sour cream. Soy-Free: Namaste Gluten-Free Perfect Flour Blend does not claim to contain soy, but it does contain xanthan gum, which can cause issues with people who have soy sensitivities and allergies. For these reasons, I will not claim that this recipe is soy-free. You can use regular flour (if you can have it) or a soy-free, gluten-free flour of your choice. Keep in mind that if your blend doesn't contain guar gum or xanthan gum, you may need to add between 3/4 to 3 teaspoons of ground flax seed, guar gum or xanthan gum to help with textural issues, too. You'll have to make sure all of your ingredients are soy-free, too. Egg-Free: Use an egg replacer for the eggs or any of the substitutions listed here for the eggs. Other Fats: As mentioned in the Milk-Free variation, you can use shortening, lard, coconut oil, a dairy-free "butter", etc. for the butter in this recipe. Sour Cream Substitution: As mentioned in the Milk-Free variation, you can replace the sour cream with vanilla or plain yogurt, if you wish. Colored Frosting: You can color the frosting if you wish, using natural food colorings or traditional store-bought types that fit your allergen needs. Flavored Frostings: You can change the flavor of the frosting by using another extract other than vanilla that fits your allergen needs such as strawberry, almond, peppermint, coconut, etc. You can even use it along side the vanilla if you wish or use another combo of extracts that sounds good to you. I would not use more than a total of 2 teaspoons worth of extract, though. Also, you could sub juice for the milk in the frosting for some flavor, leaving out the vanilla or not depending on your personal preference. I hope you will give this recipe a try soon and that it becomes a family favorite for you, too! This is the third Recent Reflections post of 2019. Recent Reflections goes live the third Friday or Saturday of each month. Each Recent Reflections post covers something that I'm reflecting on. 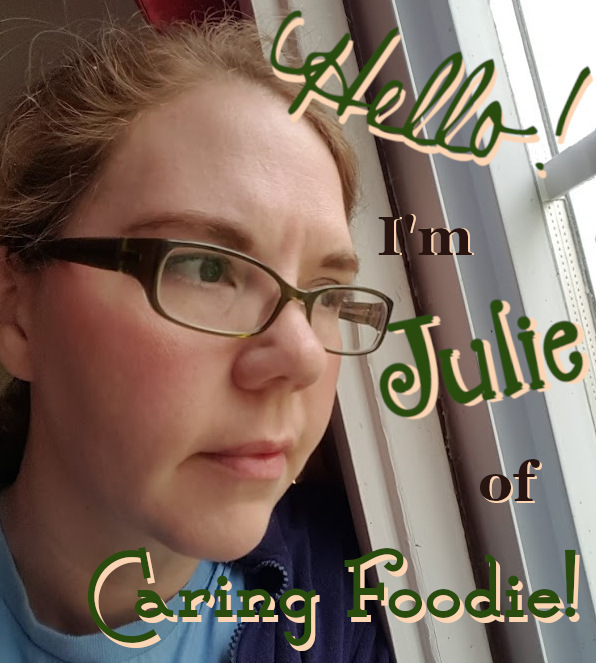 If you'd like to share a post with a similar theme, feel free to leave a comment with a link to your post, and I'll hop on over and leave a comment (and maybe some other readers will, too). This month, I will be reflecting on living a blessed life. What does it mean to live a blessed life? I used to think it meant having excessive amounts of money, having all my desires met along with all of my needs, having no worries, and living whatever my dream was for the moment. Basically, I thought it meant living with the world's view of prosperity and fortune. I have come to realize that those things - riches, fame, dream jobs - don't define a blessed life, though they can be part of a blessed life. So, what does define it? Well, a blessed life is simply a happy life. But what makes a person truly happy? It's not things or money - we all know someone who has "everything" and still battles depression or commits suicide. It's not a dream job because we all know people who have their dream job and are miserable. So, what makes a person happy? Being content with what you have (and don't have), loving the life you have and not longing for the next best thing, living in the moment vs. looking to the future - these things make for a happy life. When I am content, I am truly happy. When I trust all the details to God, I feel blessed beyond measure - even when the bank account is lean, the cupboards look bare, and/or the doctor's report looks bleak. We all know those people who are going through ridiculous hardships yet just radiant happiness, and we just don't get it. How can they be so happy?!?!? How can they not be worried?!?! Truth is, their happiness is not in their situation, but in trusting the God of the situation. They know that, even if the worst case happens, it will be ok.
How do I know? I've been there. When I was facing the possibility of MS or even the possibility of breast cancer, I felt God's peace. When I was facing the possibility of losing my daughter to a hemorrhage after her tonsillectomy, I felt the same peace. When I went through having children in the NICU twice, I felt God's peace. When I went through months of testing more than once in my life only to be told, "We don't know why you are having these problems," I felt God's presence and reassurance that it would all be ok. I was scared, I was unsure about my future, but I knew God would see me through somehow, no matter what the outcome. It wasn't that I expected a good outcome - I didn't. Truth be told, I always prepared for the worst. So, why did I still feel so blessed despite the fear and unknown? Because God was with me. You want to know the true secret to living a blessed, contented life? Live your life not coveting what you don't have and can't get. Be content with what you have already been blessed with - family, friends, shelter, food, clothing, etc. - and realize how blessed you are if you have God in your life. If God is not a part of your life, you can fix that today! How? Go here: Want Some Good News? If you have questions, feel free to email me, and I'll answer them the best that I can! I truly hope this post has been a blessing to your heart, or at the least made you stop and think a little. What has God done in your life lately to bless you? What are you reflecting on? Ok, so I don't know about you, but I enjoy dishes that are easy-peasy versions of harder ones, especially on busy days. This is one of those dishes that fits that bill, and is a recipe of my own design. It's a lot easier than traditional biscuits and gravy, because you're not making separate biscuits, and, though it doesn't taste quite the same, it still ticks all the right boxes for this biscuit and gravy fan - creamy gravy, savory sausage, and a top that is a bit like a cross between a biscuit and soft pizza/bread crust. It's also wheat, fish and nut-free (if all your ingredients are), and can be soy-free (see variations). So, if you're a fan of biscuits and gravy, you'll want to give this one a try! Note: The gluten-free baking mix I recommend does not technically contain soy, but it does contain xanthan gum (see "Soy-Free" under variations for more details) which can cause issues for people with soy sensitivities or allergies. The sausage I recommend also contains "natural flavors", though it does not claim to contain any top allergens (I am ok with listing it as gluten-free as all the research I have done to this point says it is, but if you have trouble with it, please use another brand that you know is gluten-free or make your own). Due to these reasons alone, I will not claim that this recipe is soy-free. When gravy is ready, pour it into the 9x13 pan and stir it in with the sausage until the sausage is evenly distributed. Mix up the crust by mixing the eggs, 1 Cup milk, olive oil and 1 Cup baking mix in a medium bowl until the mixture is smooth; top the sausage gravy with the crust mixture as evenly as possible. Makes one 9x13 pan which gives 12 to 24 servings depending on size. Soy-Free: King Arthur Flour's Gluten-Free Baking Mix does not claim to contain soy, but it does contain xanthan gum, which can cause issues with people who have soy sensitivities and allergies. Bob Evans Naturally! sausage doesn't contain to contain any top allergens, but contains "natural flavors". Due to these reasons, I won't claim this recipe is soy-free already. You can use another soy-free baking mix (if you can have wheat/gluten) or soy-free, gluten-free baking mix of your choice for the crust part, and can use corn or potato starch for the gravy. Keep in mind that if your baking mix doesn't contain guar gum or xanthan gum, you may need to add between 1/4 to 1 teaspoon of ground flax seed, guar gum or xanthan gum to the crust to help with textural issues, too. You can also use regular flour (if you can have it) in place of the baking mix for both the gravy and crust, too. You will need to use a sausage that you are certain is soy-free, as well. You'll have to make sure all your ingredients are soy-free, too. I do not know if you can make this recipe with non-dairy milk and butter or egg substitute with success. You are more than welcome to try it, but I know the taste will be very different, and I'm not sure how the texture will work out for you. If you do try it and it works out well, let me know! Doesn't that gravy look delish!?!? It is! Well, we've sure had some massive winter storms here in Northern Michigan the past few weeks, sheesh! And my BFF, Mr. Weatherman, has called for MORE tonight, but, see, there is a problem with this!! I am ready for S P R I N G to SPRING! I have that fever...the one when you have GOT to open those windows and doors and sweep your months of dust and germs outside and prepare for the sunshine! But alas, I have to wait. So, my March oil choice is Citrus Fresh! Why? Well, not only am I going to get a kick up in my energy, but my downright depressed snow-self is going to get that kick in my mood that I need to carry on. What is in this gorgeous bright bottle? Spearmint, Lemon, Orange, Tangerine, Mandarin and Grapefruit! Talk about a refreshing one, right!?!? It's better than picking a fresh fruit right off of a southern blooming tree! Oranges are second in size to the grapefruit. This citrus fruit has a thick skin, is round in shape, and has a tart flavor. Mandarins are a type of orange and the overarching category that Tangerines, Clementines, and Satsumas fall into. They are generally smaller and sweeter than oranges, a little flatter in shape, and they and have a thinner, looser skin that makes them easier to peel. Tangerines are a specific type of mandarin orange. They are a bright orange color, slightly tougher skins, and their flavor is a little less sweet and a bit more tart. So aside from just opening this bottle and inhaling the aroma (which you can do and still enjoy the health and energy benefits!! ), you can also use it in a variety of recipes! You can add it to your ice water, you can mix it into your frosting, or you can even shake up your very own salad dressing oil! The way you choose to kick up your life with this bottle of sunshine can vary depending on circumstances, too! So, like today with tons of snow outside my window and more on the way, I'm using it as an encouragement to my mood and my home! I shook up a bottle of sunshine and sprayed it in every room onto my carpets as well as my curtains! 1. Fill the bottle with lukewarm water. 2. Add in 10+ drops of Citrus Fresh. And that is IT guys!!!! Shake it up well and go to town on your home! 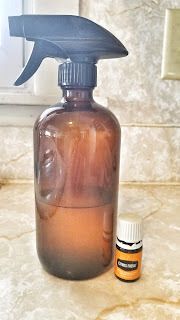 I use the mist setting for most of the rooms, but will turn that spray nozzle to stream and shoot it directly down any drain in my bathroom or kitchen. It fights that bacteria and germy yuck that is clinging inside those pipes! Once you're done spreading the sunshine, add a drop into your water and enjoy!! You'll feel like a new spring chick! *Click on the link to view the ingredient list to see if this product is right for you and fits your individual allergen needs. There is also a Vitality variety of Citrus Fresh. You can search the other oils and blends here. Ready to have your own bottle of Citrus Fresh, make your own Citrus Fresh Room Spray, or want to know more about how to get your own oils? 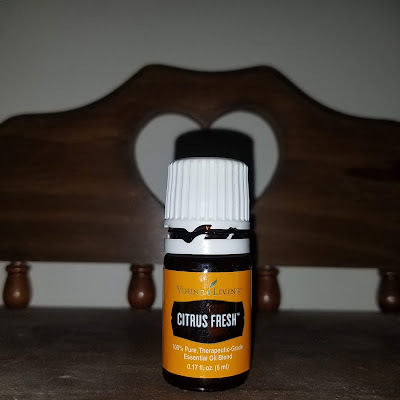 I hope you all have enjoyed learning a little more about Citrus Fresh Essential Oil Blend. If you have further questions, please leave a comment below and Jess will respond as she is able or contact her via her "Contact" page.